Somebody met him in New York, just off a cattle-ship. Somebody else saw him in Buenos Ayres. Somebody, again, spoke sadly of having been pounced on by him at Monte Carlo and touched for a fiver. It was not until I settled down in London that he came back into my life. We met in Piccadilly one day, and resumed our relations where they had broken off. Old associations are strong, and the fact that he was about my build and so could wear my socks and shirts drew us very close together. Back in June, you may recall, I gave my father a copy of P.G. Wodehouse’s Ukridge. Previous attempts to introduce Dad to the joys of Wodehouse had been unsuccessful – both The Little Nugget and a Jeeves novel had failed to click. But after a decent interval of about a decade, and a good deal of musing on the Psychology of the Individual, I bunged a copy of Ukridge in the post. I felt supremely confident in my choice. Reading Ukridge always gives me a warm inner glow, and much of my early reading was influenced by my Father’s tastes. How could it fail? But as soon as the parcel left my clutches I began to waiver, because Ukridge is Wodehouse’s most divisive character. Some fans don’t enjoy these stories at all. A look at Goodreads reviews for the book help to explain why. 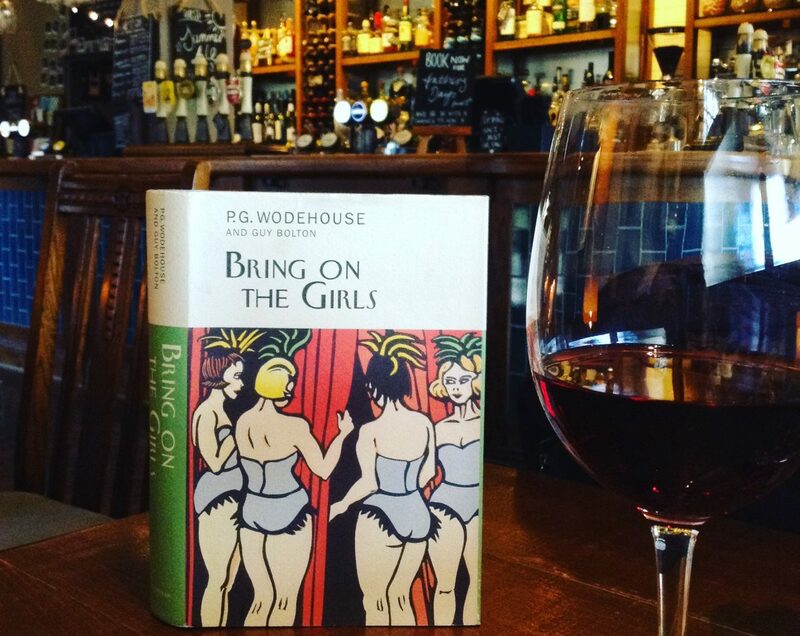 RACHEL: This is the first of Wodehouse’s books that i’ve read that didn’t involve Jeeves. I can’t say I was overly enamoured. The book is set out in 10 shorter stories, many of which refer back to previous episodes, and are based around Ukridge trying to make money and in most case failing miserably. The stories were quite short and I found myself reading quickly just to get to the end of them. They do not have the same kind of humour that other Wodehouse novels do. Quite disappointing and not the place to start with Wodehouse. So many better novels have been written. Ukridge is not a novel, but a collection of short stories. Partly, it’s the central character of Stanley Featherstonehaugh Ukridge that some readers dislike. Ukridge takes brazen advantage of the bonds of family and friendship to support his money-making schemes, and Corky the narrator is repeatedly put upon in this way. No sensible reader would want a person like Ukridge in their life, and some object to him on the page too. It’s a pity, because he’s a tremendous character. Ukridge is also sometimes dismissed on the grounds of being an ‘early’ character, having first appeared in 1906 in Love Among The Chickens (which Wodehouse later rewrote). It’s not a view I happen to share. Much of Wodehouse’s early work is outstanding (I read the school stories often) and by the time Ukridge was published in 1924, Wodehouse had classics including Something Fresh (1915), Leave it to Psmith (1923) and The Inimitable Jeeves (1923) under his belt. Most of my own favourites were written during this period. But I suspect the main cause of disappointment for Ukridge readers is that he is not Bertie Wooster. So often, the modern reader works their way through the Jeeves and Bertie stories without exploring the wider Wodehouse world until the supply of B. and J. has given out. The poor reader, familiar with these stories and expecting more of the same, finds a chap like Ukridge a bit of a jolt. Indeed, Corky felt much the same way whenever Ukridge made an appearance in his life. I took it and opened the envelope with a sigh. I had recognised the handwriting of Ukridge, and for the hundredth time in our close acquaintance there smote me like a blow the sad suspicion that this man had once more gone and wished upon me some frightful thing. DAD: I was a little hesitant about starting it, because Wooster was not one of my favourite characters, but I became hooked and had to ration myself to two stories per night otherwise I would have still been reading at midnight! The plots were deceiving – they seemed simple but became ever more complex. I liked the way it all came together in the last few paragraphs – leaving me somewhat stunned at the Wodehouse ingenuity. Although I doubt that the moral message of the Ukridge person would sit well with today’s “correctness” in all things. However the cover of the modern edition was a bit off the mark. It depicts Ukridge as a John Lennon look-a-like – dapper and suave – with the tattered yellow mackintosh looking more like a tailored double-breasted overcoat! I’m delighted that the old boy, now in his 70th year, and Wodehouse have finally clicked. I’ve sent him Blandings Castle and Elsewhere by return post. For more on Ukridge, try these two excellent reviews from Karyn Reeves, and a new Wodehouse blogger Paul Taylor-Greaves (welcome to the gang, Paul). Just excellent, in every way. Much obliged, Morten. Thank you. Yes. In real life it wouldn’t be funny at all, but Wodehouse manages to keep the delicate balance, I think, between comedy and tragedy — by ensuring nobody really suffers in any serious way from his schemes. Hahahaha. Lunch would be wonderful, although fivers in regrettably short supply here. I’m enjoying your blog and look forward to future instalments. I regret that I must disagree with HP’s no doubt worthy Father, but I can never like or approve of Ukridge. The man is simply dishonest, and injects a sour note into the usual lightheartedness of classic Wodehouse. My hope is that his trusting, wide-eyed wife Millie never discovers the true character of the husband she bizarrely regards as a king among men. I agree she is young and seems to worship the ground he walks on but I suspect they are closer soulmates than simply in romantic love – especially as Millie is hardly an innocent, given that it is her idea in the first place to pinch the parrot and pretend it’s a kidnap victim. As for dishonesty, Percy Pilbeam, Dolly and Soapy Malloy, for example, aren’t exactly pillars of the community and I find them tremendous fun. To be fair, I do see where you’re coming from and it did take me a while to warm to Ukridge, however when he tries to put right his mistake re Dora Mason, I think we see the better side of his character, which proves there is more to him than at first glance. What ho, Murray. My father would sternly disapprove of a Ukridge type of person in ‘real life’. Ukridge is a bounder, and it’s understandable that people find him unlovable. I love the stories, but I think that’s because Wodehouse knew where to draw the line. The person who suffers most is usually Ukridge himself. The exception is poor Millie and I think it was quite right of Wodehouse to ‘drop’ her from the later stories. Excellent news Honoria! I’m so pleased to hear that your dad enjoyed the Ukridge stories! I must admit that I took a while to warm to Ukridge myself. Although I have always adored Love Among the Chickens, I didn’t really enjoy the short stories when I first read them. But now I feel that I have a deeper, finer appreciation of them – and of Ukridge, although I certainly wouldn’t want to meet him in real life! Well, here’s the thing. I sort of know a real-life Ukridge type. It’s someone I can’t completely shake off and if I ever returned to my home town I would have to be very strategic in my choice of home location to avoid unexpected visits. But… the stories I could tell you about this person are …priceless. I can heartily empathise with Wodehouse (who based Ukridge on a real person) wanting to write about him. Oh dear, what’s this? People failing to take the broad, flexible view that wins to success? Ukridge is one of those reprehensible characters that turn up from time to time (e.g. Raffles) who are loveable for the failings and their failures. Like so many schemers he puts so much effort into what he’s doing that you wonder why he just doesn’t simply get a job – but of course that’s not freedom. That’s more like working in a bank. Anyway I’m glad the Father of Mrs Plum has finally made it into the ranks. Perhaps, Honoria, for your next project you can work your magic with my multi-degreed brood. What Ho, Noel! Yes Raffles is a good example. Flashman is another that springs to mind. Flashman is an appalling person, without any redeeming features that I can think of. But he is a great character! I think that is the distinction to make — one can be a great character in the literary sense, without being a good character in terms of moral alignment. I am of the Hedgcock School: SF Ukridge is unlovable qua Ukridge and not merely as measured against other Wodehouse characters. More of an anti-hero and as such doomed to, albeit humorous, attempts and failures. I have always suspected his brazenness is a alter-ego of Plum’s; the forward young man who Plum wished he could be; instead of the shy, retiring author. Plum prowess at some sports and his life-long love of physical activity is also, to my way of thinking, an aspect of that personal character. I am glad Honoria’s father found some Wodehouse to like, but, nothing personal, I wouldn’t let him hold my wallet. What ho, Ken. Presumably you mean Ukridge (not my father) whom you wouldn’t want holding your wallet. In which case, I quite agree. I can vouch for Dad as an utterly safe pair of hands with no stain on his character. My understanding is that Plum based Ukridge on a person he knew (and presumably like Corky, wanted to get a bit of his money back by writing about him). As I said to Noel above — there is a distinction to make between a good character in the moral sense, and a good character in a literary sense. Ukridge is a great literary character — and I love him utterly in that sense. But it’s definitely not an endorsement of his moral character. Undine, yes I have heard that also, but I can’t recall where the quote comes from. i’ve never understood why Ukridge never became a successful politician. He would seem to be ideally suited to the role. Hi Jon. Quite so — he has all the makings of a politician, but he would definitely cease to be amusing at that point. I’ve never been particularly fond of Ukridge – I find him irritating and perhaps a bit predictable. Not that I am against the earlier works, mind you. On the contrary: my favourite PGW character of all time is Psmith. “Leave It to Psmith” is my favorite Wodehouse novel, next only to “Code of the Woosters.” It would make an enchanting film, if they only made films like that anymore. I’d never thought of that, but you’re right, it would be wonderful! You are in good company Deborah. Many people feel likewise — about both Ukridge and Psmith.